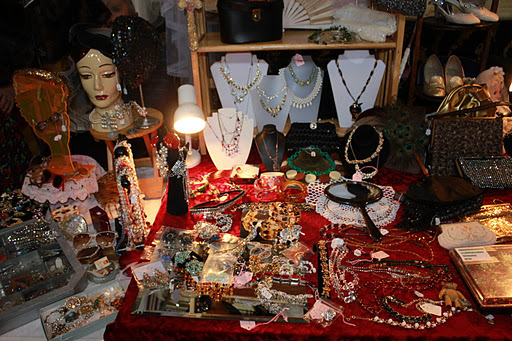 Leeds vintage fair does it again! 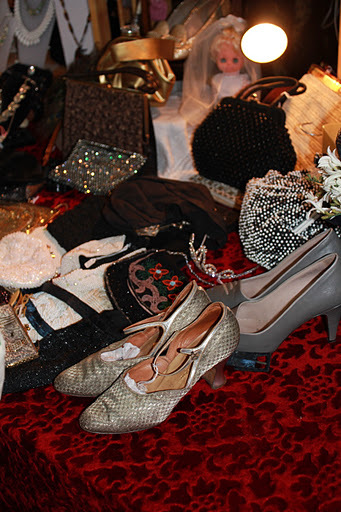 I absolutely love Leeds vintage fair and today was the day yet again. A rather fab day was had I have to saay. I’m trying to be good money wise at the moment, so I didn’t go too overboard on purchases, but these are the two dresses I picked up! Then I picked up this beautiful dress too, not my normal style, but it was pretty cheap and I thought I might find an excuse to wear it! The lady who I bought it from has some absolutely sensational stock. She sells through ebay, Dolly Wiggins vintage I strongly recommend you check her out, she had a wonderful selection of 30s, 40s and 50s dresses all at v v reasonable prices at the fair. I could have bought more, but as I say I am (meant to be) on a budget! I can’t believe that 2011 is coming to an end, it is a petrifying thought. 2011 has been the best year of my life. I remember at the end of 2010 my best friend and I Katie Rickard stating this is going to be our “year of opportunities” and goodness me, it has been (This is true for both of us by the way, my amazing best friend this year got a first in her undergrad degree from Warwick in politics and international studies, is now doing a paid internship with the OSC and has been offered a place at Oxford for her masters). I started off the year working for Hampshire museums service on my placement, which I began in 2010. Although, it was really 2011 that was my crowning glory. 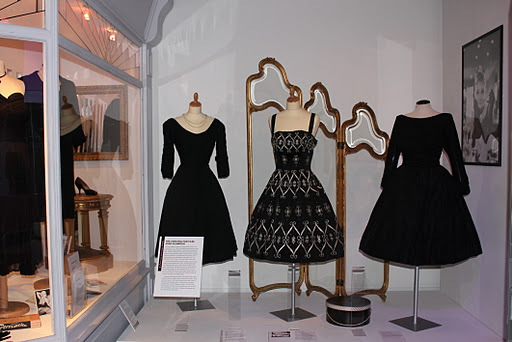 Seeing the Little Black dress exhibition that I had worked so hard on open in February and receive amazing comments and feedback was really enthralling. It felt like such a vindication to see all of the wonderful objects I had chosen bring back memories and provide people with inspiration. 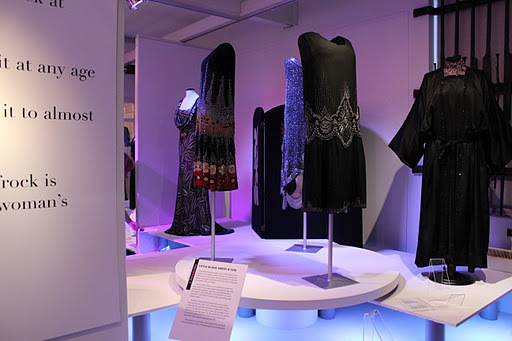 One of the best things though was seeing the exhibition awarded with a guide award in November 2011 for “best exhibition”. Wonderful stuff! I continued my time at the museum service working on a number of other wonderful projects and meeting some truly amazing people. Although one thing I have to say is that my placement allowed me to meet one of the most wonderful people I know, my supervisor Alison Carter. Alison knows more about dress history than I think I could ever aspire to know. In the time I worked with her she taught me so much and offered me so many opportunities. Not only is she a fantastic curator and historian but she is also one of the loveliest most giving people I have met, and I don’t think 2011 would have been even half of what it was without her. This year blogging and twitter have taken me to all new places ( I now have more views on my blog per day than I got per month at the beginning of the year!) Social media allowed me to meet Naomi Thompson, one of the friendships I feel most privlledged to have made this year. 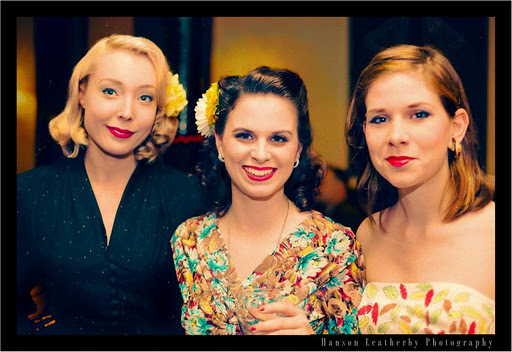 Naomi is best known as stylish and vintage personal shopper Vintage Secret. I helped Naomi out with her book Style Me Vintage which is out in February. (Just a tad exciting!) You can pre order on Amazon now!!! Naomi is another insanely kind and generous person who has allowed me to see some wonderful pieces from her collection and also allowed me into the vintage world of London. Without her I don’t think I would have plucked up the courage to go to some of the events I have been to. Both of these events I went to alone. But everyone was so welcoming that it didn’t matter. I have to say special thanks to Mara, Johanna , Sophie, Simone and all of the VM for really making these events so fun! 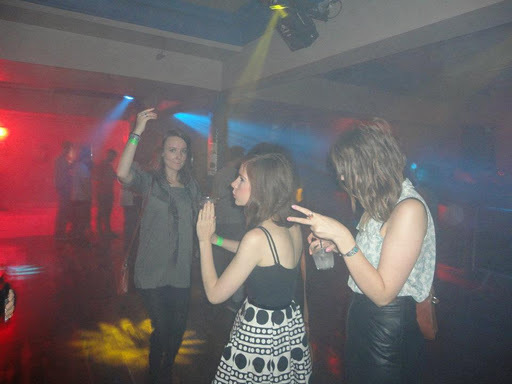 Coming back to University was a scary experience after a year out. But I am in the process of writing my dissertation which I hope should become a piece of interesting an exciting research on the wearing of historical dress. And my two design modules aren’t going anywhere near as badly as I thought they might do. And at the moment I am applying for masters, here I am with fingers crossed that maybe I might just get offered a place at one of my universities of choice. I need to live the academic life! I have to also offer my thanks to my wonderful housemates, Vic, Ally, Emily and Laura. 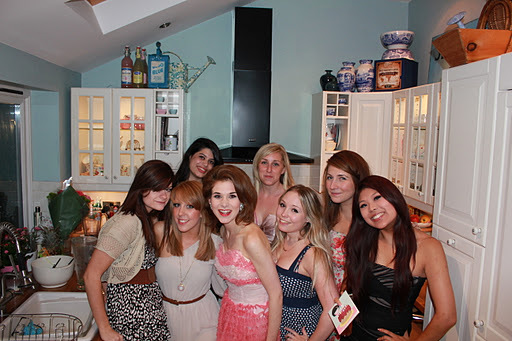 I love them all to pieces and my uni experience wouldn’t have been half of what it is without them. I have to say a huge thanks to them too for putting up with the vintage selling I do from my bedroom, taking in the ridiculous number of parcels I sell and putting up with all the fur coats I had stinking out the place for months! So yes, professional life on track, uni life on track and for once maybe even my personal life is on track. Thanks for treating me so well 2011 and roll on 2012. Today I decided that I needed a day out. Unfortunately I’ve been stressed out to the max with uni work and unless I am going to university or the post office I have altogether stopped leaving the house. (O.k. I did go to Bristol last weekend, but we’ll discount that) On the plus side this means that all I have been wearing on an almost daily basis is pajamas (no ironing, excellent), but on a negative note I will probably start suffering with some of vitamin D deficiency because I rarely see natural light (I’m only in uni two days a week meaning I really do barely leave the house). This is heightened by the fact that my bedroom is what would have once been the front room of the house, hence I don’t open my curtains. Anyway, that’s enough about the depressiveness of my life! 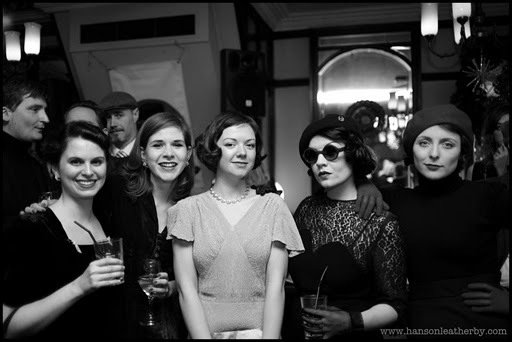 The real point of this is that today I went to a vintage fair, not only that a really rather good one! 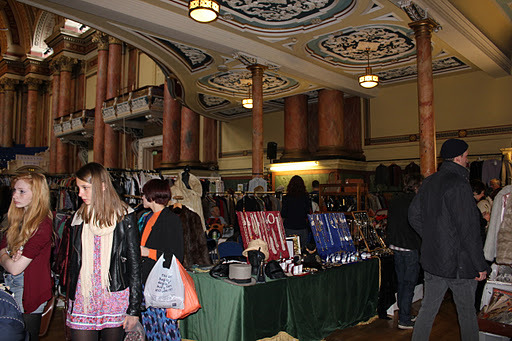 So, the location of the vintage fair was Leeds town hall. Which as a venue is somewhere that I totally love. Very Victorian and just very Leeds as well. Whenever the antiques roadshow comes to Leeds this is where they always go. I cannot recommend this fair HIGHLY enough. Fantastic was not the half of it. The sellers there were all lovely, happy to chat and up for a bit of bartering. Unfortunately due to the precarious state of my bank balance at the moment I had to be a bit restrictive on my spending. 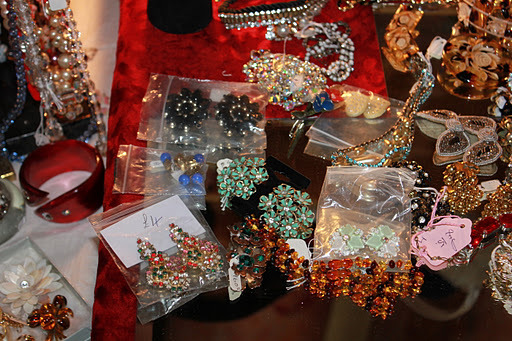 I could have bought so much more because prices were (on the part of most sellers) very reasonable. I saw a lot of high quality 50s cotton dresses of the sort I normally by at around the 25-40 price point which I think is pretty good. For anyone interested in antique clothing and textiles this fair is a must. I actually lost count of the number of genuine Victorian dresses I saw. 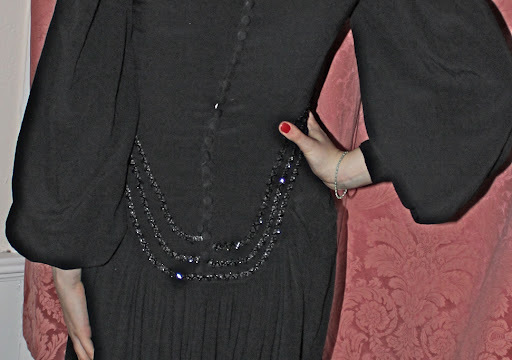 There was a particularly spectacular purple Victorian silk dress that I was amazed to see there. The condition was fantastic and unusually the silk had not shattered. It was difficult to tell hanging up exactly the age of the dress although the vivid purple of it immediately made me think 1860s, AND it was only £95. If I had had my dealer head on rather than my student head I would definitely have bought it! First up this little knitted dress which I picked up for the bargain price of £10. The seller whom I bought this from was selling things at pretty amazing prices. It was marked up as being 70s, but I’m not so sure. Something is saying to me its earlier (unfinished seams inside and a very old looking metal zip). 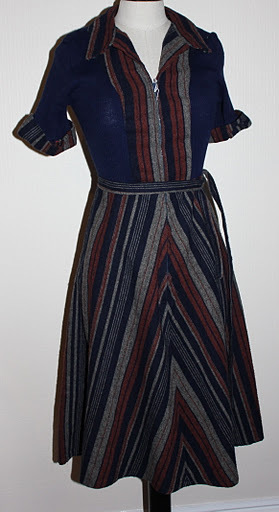 I love chevron designs and this dress is going to be a great little winter piece I think. It’s an excellent fit too! 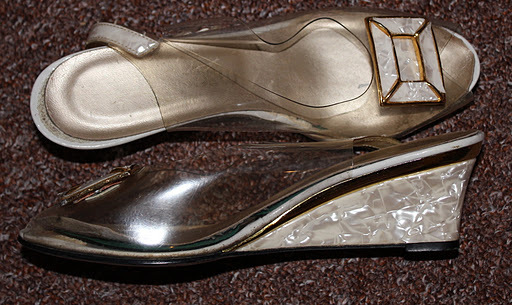 Then I bought these shoes, again this lady was selling her items at really great prices (£10!) I vey much regretted not snapping up a pair of crazy 50s cats eye marbled sunglasses for £15. She also had THE most sensational 30s wedding dress which was an almost exact copy of the dress worn by Wallis Simpson in 1937. It was in excellent condition too, whoever snapped that up got an absolute bargain I think. 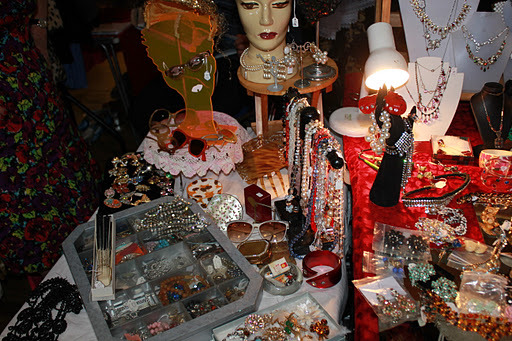 Nearly all of the images here are from this lady’s stall. Lovely stuff! And finally my absolute gem of the day. 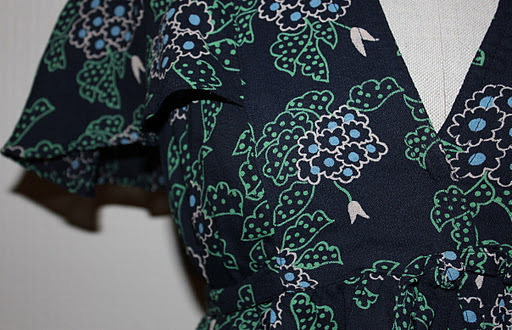 A wonderful 70s Radley dress with a (probably) Celia Birtwell print. When I get a spare five minutes I am going to do a little bit of research into this and try and find out for sure that it is but I’m pretty sure it’s right. The dress is in wonderful condition and fits me like a dream. I’m so happy with it! The seller who I bought this from was wonderful. I can’t enthuse enough about how great her stock was. For someone who rarely does 70s it was a dream. She had lovely Radley pieces as well as some Bus Stop and Ossie Clark. I could have spent a few hundred on her stall alone! This is my outfit for the day, all this not leaving the house means that when I do go out I tend to make an effort! The dress is a Horrockses (what a surprise) and I’m wearing one of my fave pairs of vintage earrings from Brilliant in Kingston (Surrey). The cardi is a non vintage one. It’s from American eagle. I think I’ve had it since I was 12 or 13! 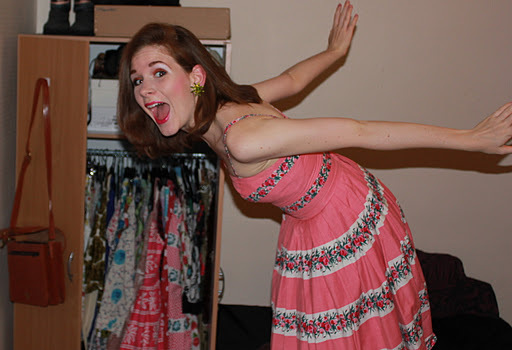 Also, I just thought this was a nice opportunity to throw in a few of my vintage outfits of late! Please ignore the mess of my room in the background of most of the pics. I’m not the tidiest of people at the best of times! 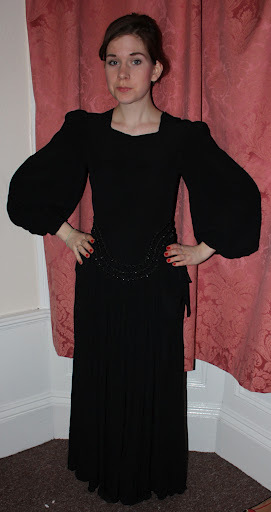 My all time favourite vintage dress (I think). This was the first Horrockses I ever bought, its getting a bit tight on me now but I still adore it. I was actually dancing manically around my room at the time, hence the picture of me jumping off my bed. It’s a pretty good action shot! In the background you can just about see my vintage wardrobe, yes I do have a specific wardrobe for vintage!!! One of my blanes dresses. 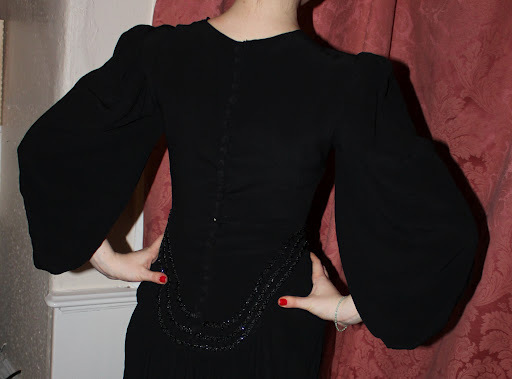 You may have seen my blue one in a previous post about the last vintage fair I went to.